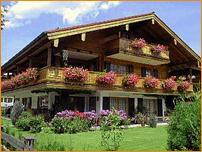 Here you will find a last minute list of available rooms in Berchtesgaden and surrounding area at last minute prices. You may contact the Landlords for reservations via telephone or Email . Three cosy non-smoking holiday apartments for 2-3 people with either terrace or balcony and TV. There is a lawn for sunbathing as well as enough space for the children to play. Pretty footpaths lead you directly into the beautiful environment of the district Berchtesgadener Land. Our well-maintained guest house offers you double rooms with shower/WC or economic guest rooms with shower on the same floor in a wild-romantic environment. The absolutely quiet position of the house Waldfrieden, in the middle of the mountain world of Berchtesgaden will make your holiday to an unforgetable experience.You will definitely feel at home here in our cosy house. Our comfortable, exclusively furnished 4-star-non-smoking-apartment on the 1st floor of our house with living/dinning room, 2 bedrooms, 5 beds and 2 bathrooms in central, but quiet position is your perfect holiday home here in Berchtesgaden. A lawn for sunbathing as well as two parking lots belong to the house.